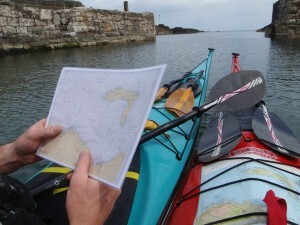 This Next Step Night Navigation for Sea Kayakers course is aimed at paddlers who hold the Sea Kayak Award (or 3 star) or those of similar experience. When on the water early or late in the sea kayaking season it is not unusual to find yourself completing the last leg of your journey in darkness. The aim of the Next Step Night Navigation for Sea Kayakers evening is to introduce paddlers to the skills involved in journeying at night or in poor visibility. Over the course of the evening on the ‘Next Step Night Navigation for Sea Kayakers’ course, we will cover a range of areas including boat set up for night paddling, group management and briefing, navigating, using a compass, use of lights, safety considerations, etc. The ‘Next Step Night Navigation for Sea Kayakers’ course is for paddlers who would like to develop their poor visibility navigation and experience life on Strangford at night! Students will be able to avail of all technical kit and equipment from our extensive stores. This does not include personal items such as thermals, fleeces, hats, gloves, swimwear, etc. Students are encouraged to bring their own equipment as we have found that paddlers are often more comfortable using their own. It also gives you the added bonus of getting feedback from the coaches on its suitability; therefore we would actively encourage you not to buy before attending the course. You will also be required to bring a head torch and compass. The Next Step Night Navigation for Sea Kayakers course fee includes kit and equipment, in-course transport, instruction, tea/coffee and a famous chocolate brownie or flapjack.